Glass blowing is an ancient tradition and art-form which has enriched our lives with adornments since man first learnt the benefits of heating sand. We make use of glass products in and around our homes in all shapes and sizes on a daily basis, and while it is common knowledge that glass is formed through a careful process of blowing, not many people know exactly what goes into it. So, to satiate your curiosity, here is a little information on its process. To make the glass malleable, it needs to be heated to incredibly high temperatures. A furnace is needed for this, and it needs to be heated to a staggering 1,090 °C. That’s about the temperature of molten lava, or if you’re feeling dramatic, it is 1/6 the heat of the Earth’s core. From here, molten glass can be gathered on a blowpipe by rolling it over the molten glass in the furnace. Now, the molten glass and blowpipe should be carried to a marver where it should be rolled out to distribute the heat evenly around the glass, allowing you to shape it cylindrically and symmetrically. From here it can be taken and rotated in a crucible or glory hole. This will need to be done several times while the glory hole is used to keep the glass hot and easy to manipulate. Next, the glass is dipped into crushed colour class, flecks and steel depending on the design and desired outcome. This is then placed back into the crucible to be heated up, allowing the crushed and coloured glass to melt into overall structure. Place the blowpipe complete with the glass on a steel stand. Now blow into it while rotating it at the same time, letting deep breathes into the pipe to blow air into the glass. Do this in 10 to 15 second intervals to ensure that the glass does not cool, which will make it difficult to blow and to fashion. Repeat the process of returning the glass to the crucible and blowing it again until you get the size and shape you are looking for. Use jacks (sort of like tweezers) to remove the bottom of the blown glass from the structure as you turn the pipe, this will allow it to be removed from the pipe with one solid tap (any more and you risk breaking the glass). 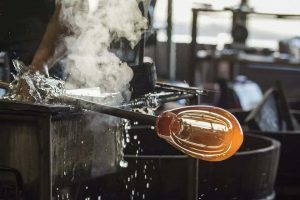 The glass should be caught (generally with fireproof gloves or in a fireproof box) and then left in an annealing oven for about 14 hours so that it can cool to room temperature slowly. Remember that glass tempers and cracks with sudden changes in temperature; so this process should never be rushed. If you would like to know about glass blowing, or are interested in sourcing high quality glass products from a manufacturer with exceptional experience and style, contact a representative from Shades of Ngwenya today, or visit our website for details.